Abu Dhabi: Etihad Rail, formerly known as Union Railway, the master developer and operator of the UAE's first railway network, will construct 1,200 kilometres of railway routes in the nationwide project valued at Dh40 billion to be fully completed by 2018, it was announced here at a news conference late on Wednesday. "The network's aim is to support the country's economic development, enhance the transportation infrastructure and improve the investment potential of the UAE through offering an alternative transport network that is efficient and provides an ideal logistics platform for current and future industries," said Nasser Al Suwaidi, chairman of the board of directors of Etihad Rail. The previously estimated cost of the rail project, which will carry freight as well as passengers, was between Dh25 billion and Dh30 billion. The Etihad rail network is poised to connect the emirates and link the UAE to Saudi Arabia via Ghweifat in the west and to Oman via Al Ain in the east. The project will be completed in three phases — phase I of the project incorporates the Shah-Habshan-Ruwais route — with the link between Habshan and Ruwais scheduled to be completed in the beginning of 2013 and that between Shah and Habshan by the end of 2014. Phase two of the project involves the constuction of the remainder of the Abu Dhabi Emirate Network and a connection to Dubai — covering vital areas such as Mussaffah and the Khalifa and Jebel Ali ports. The third and final phase entails the implementation of the rest of the network in the northern emirates. "The rail routes will integrate and seamlessly link vital residential, commercial and industrial centres along with sea and land ports in the country. "In addition, they will link with the GCC railway network, improving trade among member countries and facilitating passenger travel as well," said Al Suwaidi. He said Etihad Rail has successfully completed many economic, technical and feasibility studies to measure the cargo and heavy transport operations in the country and now aims to transport 50 million tonnes of cargo during the first phase of the project. Richard Bowker, chief executive of Etihad Rail, said the ownership structure of the company is that it's owned 70 per cent by the government of Abu Dhabi and 30 per cent by the federal government. Bowker said as far as the financing strategy of the rail project is concerned, the company is working with UBS and in due course the decision on the financing strategy will be made after presentations to the board and higher authorities. He said the locomotives willo run on diesel but there will be "provision for electrification" if traffic demands it. The freight trains on the network will run at speeds of 120 km/h and passenger trains at speeds of up to 200 km/h. Route linking Habshan to Ruwais to be completed in early 2013 and Shah route by end of 2014. 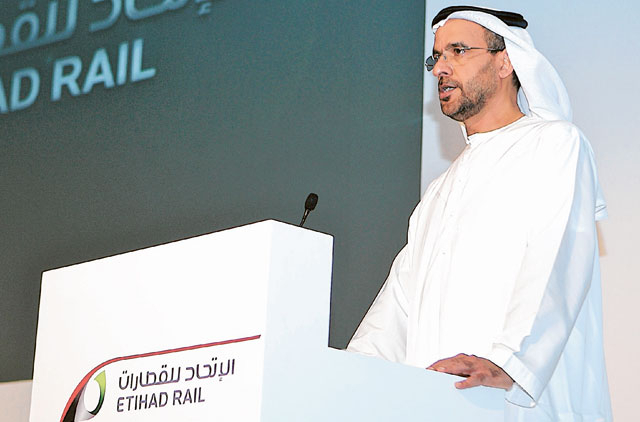 Etihad Rail will finalise design for second and third phases of the project by the end of this year and construction to begin in the second half of 2012. The company will transport approximately 50 million tonnes of freight and 16 million passengers in the initial stages. Long-term strategic partnerships with a number of state authorities are to be developed and the new corporate identity will be unveiled. Cargo containers could be transported via a modern and integrated rail network that connects the UAE to neighbouring GCC countries thus allowing eventual access to Europe and Asia.